Recently I closed a chapter in my life. The forever on going struggles of job hunting. In a few posts back I stated that I had the perfect job baking whatever goodies I wanted to be sold in an artisan shop. My excitement was short lived and I ended up making sandwiches all day from 6am. Not my idea of perfection. 1. I am not a morning person so leaving my house at 4.15 to take 3 trains and a bus to make sandwiches was my idea of hell. 2. If I wanted to make sandwiches all day I would have applied for a job in Subway. That amongst numerous of serious hygiene issues and the lack of managment and organisation I had to leave. Since then I have found a new job which is more closer to home and I actually get to bake. For most people, when they get a new job people generally reply with different forms of congratulations. Me on the otherhand, because I change work places often I usally get the question “AGAIN”? I refuse to settle for something less than what im looking for. Somewhere where I am allowed to put my ideas forward and be creative. Is that too much to ask. Whilst I’m patiently waiting for my opportunity by God’s grace, I’m going to make these cookies. 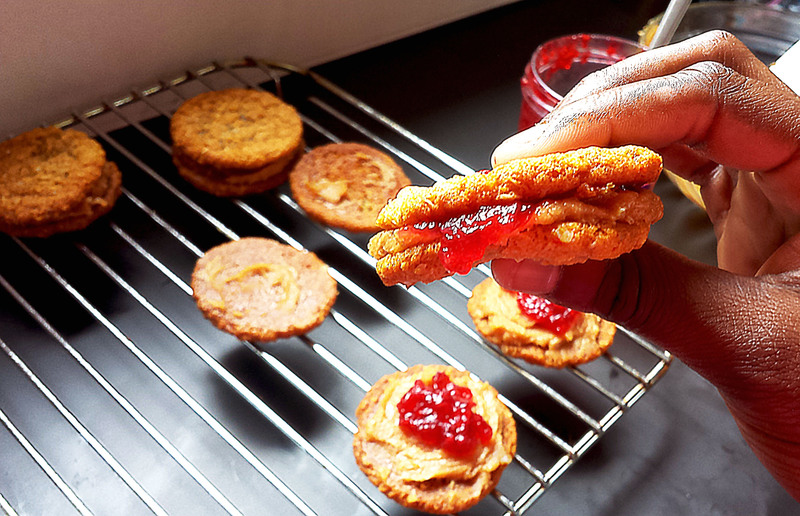 Oaty and chewy with a velvety peanut butter ganache filling complimented by fruity jam. 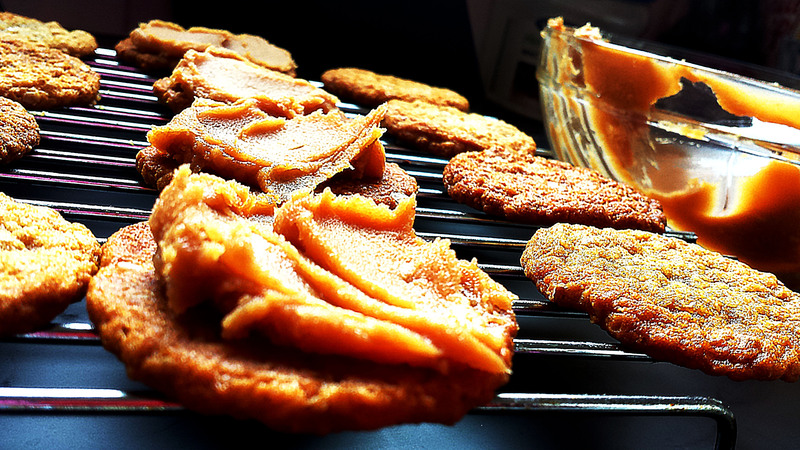 If you are familiar with the popular kiddie combination peanut butter and jelly (jam for us British peeps) which is usually in a white bread sandwich form, you will love these cookies. And even if your are not, what a great way to welcome you to the wonderful world of Peanut Butter + Jelly Sandwiches! Melt the butter and golden syrup together, then bring to the boil. Remove off heat and whisking in the bicarb and water. The butter mix will foam up. Add the butter mixture to the dry ingredients and stir till just combined. For each cookie you will need 1 tbsp of mixture. For the peanut butter ganache: Bring the cream to the boil and pour onto the chocolate and marshmallows. Allow to cool for 5 mins, then beat it into the peanut butter and leave in the fridge to firm up. For the assembly: Pair up similar sized cookies together. 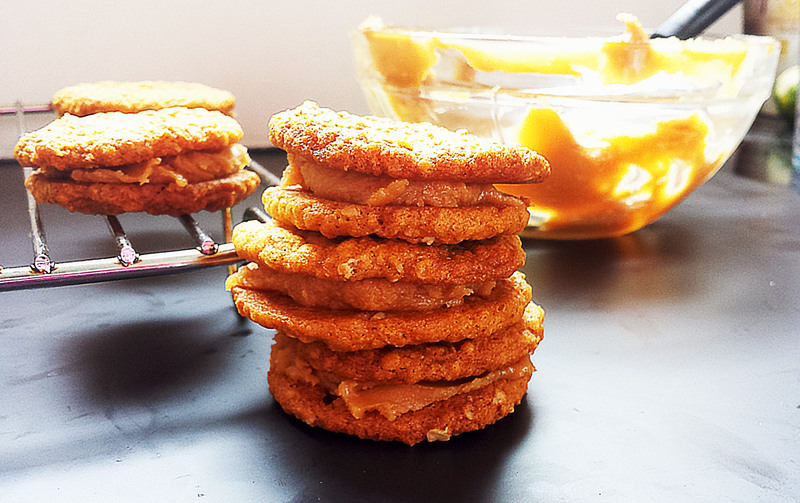 On one half of the cookie, spread a generous layer of peanut butter ganache. Place a small dollop of jam on top then sandwich with the other half. To prevent the cookie mixture sticking to your hands wet them slightly before rolling. I used raspberry jam, but if you can get hold of grape jam/jelly use that instead. Strawberry jam will also work well as well. Recently I have been making a lot of truly amazing thing using leftovers. I’ve made seafood pasta from leftover salmon rillettes, adding sweet corn and green beans which was really delicious, scone pizza using leftovers as pizza topping and now I bring you this. 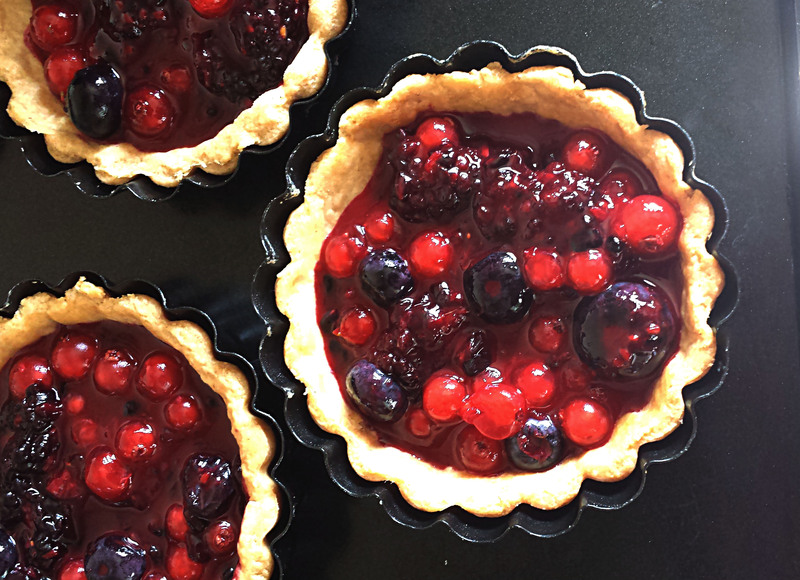 Some amazing tarts that used up the last of the leftover summer berries I had rattling around in the fridge drawer. I think some of the best meals/desserts I have made is by using up leftovers and this tart is no exception. For some unexplainable reason, I don’t seem to make a lot of tart or pies. 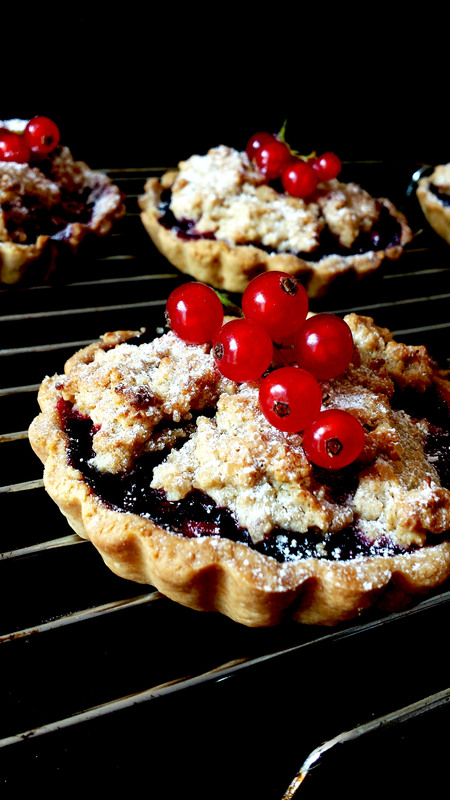 A pie or a tart isn’t something I’ve eaten a lot of growing up, unlike a lot of American households. But I am partial to a bit of apple or cherry pie. Considering I don’t eat a lot of pies I always seem to come across a few bakeries who think they can actually pull of that glutinous shop bought cherry pie filling that sticks to the roof of your mouth and sell it to me for £1.50+. You won’t find any of that horrible filling here. 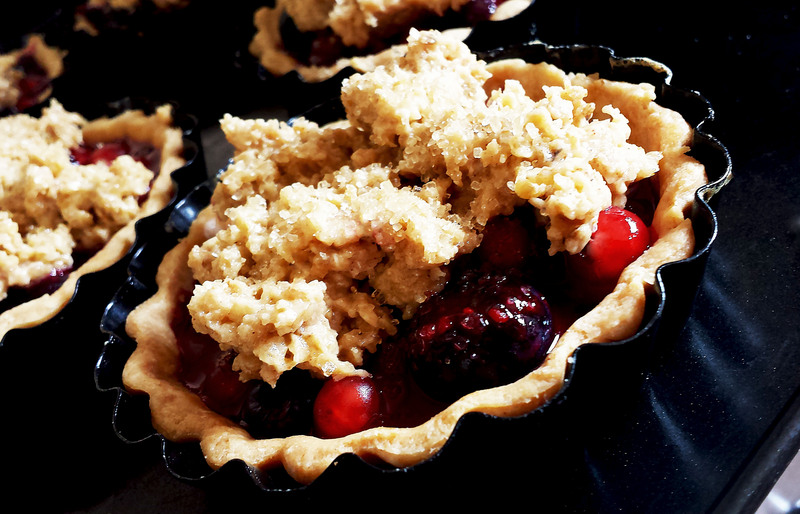 What you will find is a juicy fruity filling in-cased in a buttery tart shell topped with a cobbler like struesel oat topping which makes the whole thing taste sort of like a fruit crumb bar. The best bit is when you take it out of the oven and the juices are bubbling like a witches cauldron. If I had the ingredients on hand, I would serve it slightly warm, with some softly whipped Chantilly cream or some clotted cream ice cream because hot and cold in one mouthful is truly heaven! For the pastry: Add all the ingredients into a food processor except the yolk and the water. Turn out onto a clean surface and press the mixture into a flat disc. Wrap in cling film and place in the freezer for 10 mins. Remove from the freezer and leave it to soften a bit so it makes it easier to roll. Roll out the pastry 1/4 inch thick a line 6 4″inch tartlet tins. Place them in the freezer to rest then blind bake them in a 180°C preheated oven for 8 mins. For the fruits: Combine the cornflour with the lemon juice and blossom water to form a paste. Add the jam and fruits and leave to sit for a few minutes to extract the juice from the fruit. For the oat topping: Cream the butter and sugar together. Assembly: Portion out the fruit amongst the blind baked tart cases. Top with the oat topping and sprinkle on the demerara sugar. Bake for 10-15 minutes at 180°C oven. When cooled slightly garnish with some redcurrants. 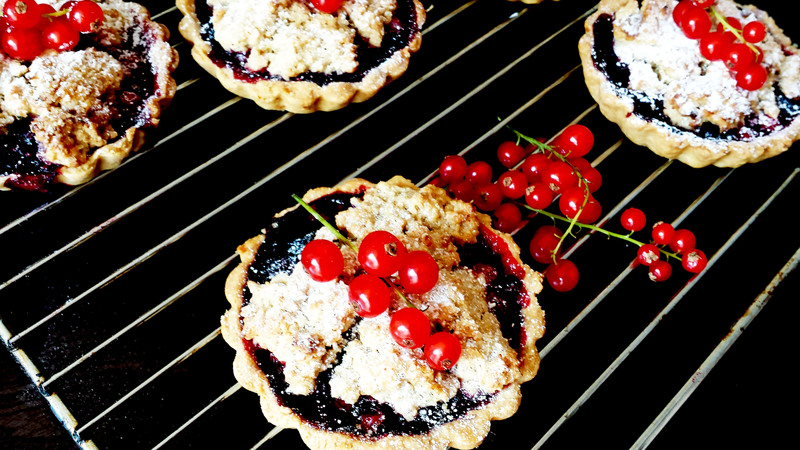 Use any combination of berries you like that are in season, as they taste better. 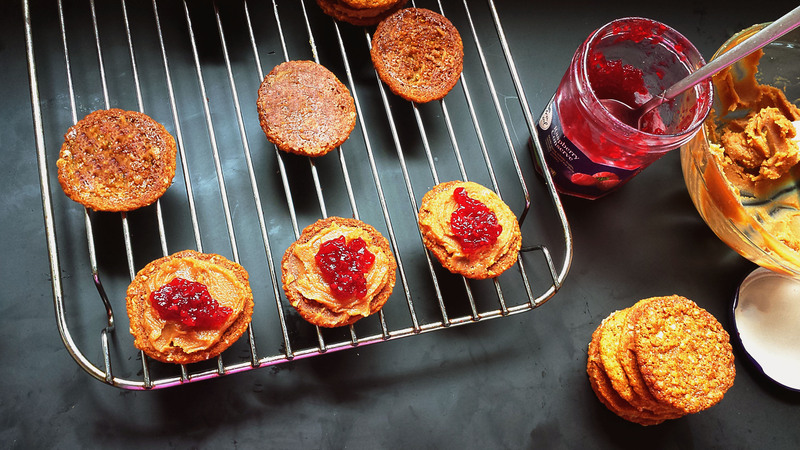 Instead of raspberry jam, use any berry jam you have.